This is very healthy and delicious dish, you can make it hot and spicy as well. You can prepare this dish for breakfast and as well as for lunch box, this dish is fit for all seasons and all time. And more over it can be prepared instantly, no need to wait for fermentation. Dall is a dried pulse (lentils, peas or beans) which has been split. 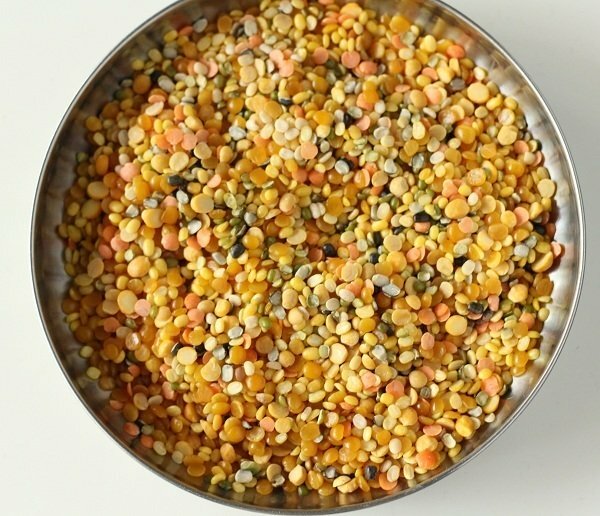 You can use any dal available in your kitchen. Split pulses (dall) are powerhouse of nutrition. They are the oldest commonly consumed food grains and at the same time, they are the one which need very less time to prepare since they don’t require a lengthy soaking time unlike other grains. In fact, I prepare it frequently for the breakfast, it is very easy and simple to prepare. Let’s see the preparation of mixed dall dosa. If you have any other grains in your kitchen, you can add those. There will not be any problem if quantity varies. The only thing you have to do is – increase the quantity of herbs and spices. Pour all grains and cumin seeds (jeera) in a single big bowl, wash them with plane water and soak them in warm water for 15 minutes. Soak them in plenty of water, because they will expand in size. Mean while you can make the other things ready. Wash and clean green chllies, coriander leaves and keep them in a bowl. Add crushed fresh coconut,cleaned garlic cloves, roughly chopped onions to it. Drain water from soaked grains, pour it into a big size mixer jar. Add all the above stuff and salt to it. Make a fine paste by adding 1 cup of water to it. If required, you can add little more water while grinding. The consistency of the batter should be little bit thicker than that of dosa. Now your pancake batter is ready to prepare pancakes (dosas). Place a non-stick tawa (pan) on medium flame. Pour one spoon of batter on heated pan, spread the batter evenly by moving the spoon in a circular manner. Close the pan with lid for 1-2 minutes, open the lid and sprinkle a very little quantity of oil over it and cook it for another 2 minutes. Turn the dosa upside down with the help of dosa turner. Cook it further for 2 minutes. If you don’t want to use oil, you can make dasas without oil, they also taste very good. Repeat the same procedure for the remaining batter. Your healthy and delicious mixed dall dosa is ready to serve. You can serve it with any chutney or ketchup.